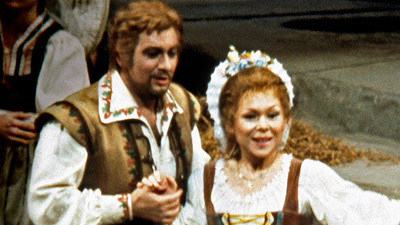 Premiered immediately before the enduring masterpieces Rigoletto, Il Trovatore, and La Traviata, Luisa Miller incorporates the youthful vitality that had made Verdi an international sensation while also looking forward to the dramaturgical discipline and sophistication of those later works. In this Live in HD performance, soprano Sonya Yoncheva takes on the riveting title role, capping off a season in which she starred in three cinema transmissions. As her father, Miller, the legendary Plácido Domingo adds another baritone role to his extensive repertoire. Tenor Piotr Beczała as Rodolfo, Alexander Vinogradov as Count Walter, and Dmitry Belosselskiy as Wurm round out the illustrious cast, and Bertrand de Billy conducts.